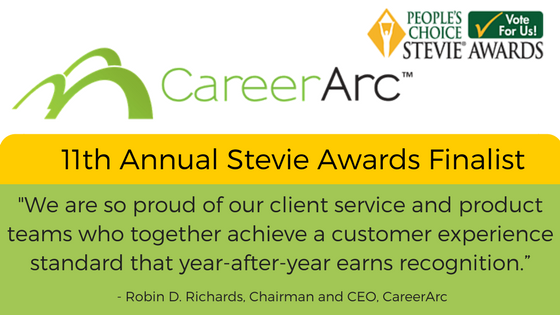 CareerArc is among a distinguished list of Stevie Award finalists which this year include IBM, Cisco Systems, Adobe Systems Inc., Delta Air Lines, DHL Express, Ally Bank, and more. View the complete list of finalists. As a finalist in the Customer Service Department of the Year category, we have also earned a nomination for a fourth award – the People’s Choice Stevie Award for Favorite Customer Service. Vote here to show your support for our customer service team! >> 1) Click on the checkbox; 2) Click on the “Submit” button. Stevie Award Winners will be announced on February 24, 2017 at the Stevie Awards gala banquet in Las Vegas, NV. 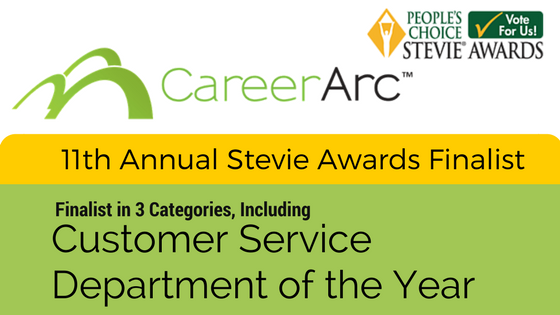 CareerArc is named a finalist in the 2017 Stevie Awards for Sales & Customer Service, marking its third straight year to earn this high distinction.